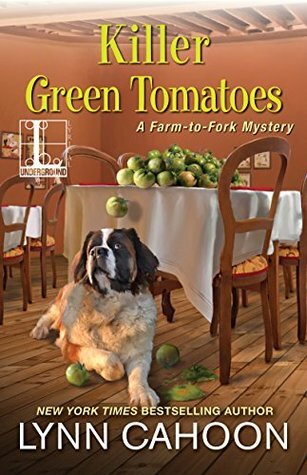 Killer Green Tomatoes by Lynn Cahoon is the second installment of the cozy Farm-to-Fork Mystery series. In this series Angie Turner has moved back to her hometown in rural Idaho after her grandmother’s passing and opened up a new restaurant, the County Seat. A month has passed since Angie helped find the person who murdered Old Man Moss, the local dairy farmer and Angie really hoped she’d be out of the sleuthing business with a restaurant to run. However, Angie’s sous chef Estebe comes to her for help when his cousin, Javier, is accused of murder. While Javier is not known around town as perfect boyfriend material Heather got the idea into her head that she and Javier were an item so when her body is found all signs point to Javier as a suspect. Angie however doesn’t think Javier actually committed the murder so she agrees to poke around town to see what she can come up with. Having read both books in this series I do believe this one got even better than the first and I quite liked it too. Angie is a likable character with strong family values, there are cute critters galore being in a farming community, Angie’s elderly neighbor is always good for a few chuckles, for the foodies there’s all kinds of dishes and there’s plenty of suspects to keep one guessing on the mystery side of things. Count me in as a fan of the series as I will definitely be waiting for book three in the series. I also enjoyed the first one, so glad to see this one is even better. Great review Carrie. It is queued up and ready to go.